A single male musician in black sits on a stool on-stage, bent over, drawing his bow over the strings of a cello. His black beard and hair are nearly indistinguishable from his clothes, but his socks are painted with traces of green and yellow, and white shirt cuffs are just visible at the end of his jacket sleeves. The suggestion of faces in the audience appears behind him, low against the gray background. The figurative subject, rich monochrome tones, and subtle background rendition distinguish this work from others in Sugimoto's early period. 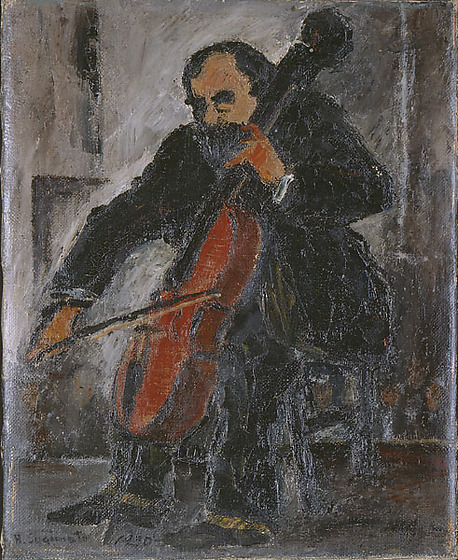 Although somewhat squat and heavy, the figure of the cellist moves in a dynamic, naturalistic manner akin to the male figures in Sugimoto's later works. 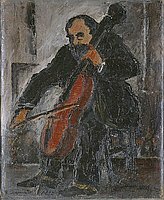 Thick, expressive brushstrokes appear more controlled than in the artist's landscapes of the time; the details of the cello and the musician's face likewise reveal notable control of paint and color. The musician's shirt and socks, indicated by traces of white, green, and yellow at the edges of his dark suit, underscore Sugimoto's interest in subtle effects of color and light. The impressionistic, indistinct gray background establishes the mood and architectural structure of the cafe interior.